DOLPH :: Showdown in Little Tokyo: Dolph Lundgren latest action-packed thriller. Dolph Lundgren's latest action-packed thriller. That super Swede Dolph Lundgren, perhaps best known for his portrayal of Sly Stallone's Russian opponent Ivan Drago in Rocky IV, has taken on a new challenge - the deadly Yakuza! These most feared members of Japanese society are immediately recognizable by their ornate full-body tattoos that tell the story of the merciless underworld order. 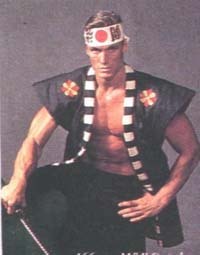 In Showdown In Little Tokyo the Yakuza encounter Dolph, the one-man gang, who immediately goes into action. And action it is. We can all relate to Dolph's fast pace from his previous films, Masters of the Universe and Red Scorpion. "I started training for Showdown four months before the shooting," Dolph states. "I do all the fighting in this film. My extensive knowledge of martial arts is really put to the test. I'm a second degree black belt - Kyokushin Karate. I do full contact Karate - Oyama. That's how I fought hand to hand, but there is also an exciting sword-fighting sequence. For that I had to do Iaido, Japanese sword combat." The 235 pounds of lean body mass gets very physical whith his karate chops and high-flying kicks, which is pretty hard for a 6'5½" guy. "I've always been flexible and well-coordinated for my size," Dolph says, "so I can make up for excess muscles mass with reflexes and coordination. Of course, my bodybuilding workout six days a week wouldn't have anything to do with it, would it?" The plot: The Yakuza arrive in the US - in LA. But they meet their match in two though cops. One's an American raised in Japan, Chris Kenner (played by Dolph), and a man fighting for his family's honor and his adopted heritage. 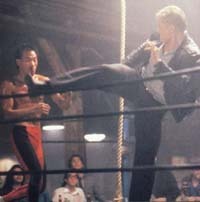 The other is Johnny Murata (Brandon Lee, son of martial arts immortal Bruce Lee), a guy who knows how to get his kicks. On the street, they're the perfect odd couple having one thing in common -the ennemy- who are bringing a deadly drug to the streets of LA. When Kenner recognizes the Yakuza leader as the man who killed his parents years ago in Japan, he explodes in to a personal vendetta in which there can be only one survivor. Real action here, folks, with Dolph's incredible physique giving it an added kick.